Nowadays think tanks that hope to have an impact on both policy decisions and public opinion must engage their audiences in diverse ways. Video can be an effective way to do that and School will allow to think tanks to confidently manage the production and distribution of high quality videos about their work. 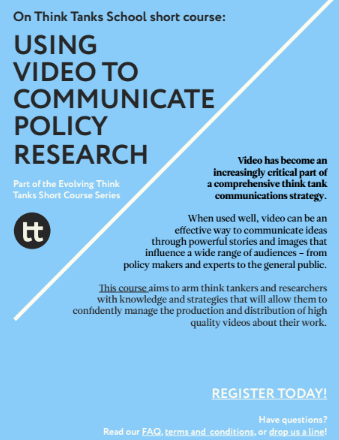 Who is this for: communication professionals, researchers, and individuals who want to better understand how to use video to communicate their ideas and research. The delivery of a proposal for a video on a topic you or your organization is working on, and personal feedback to it.